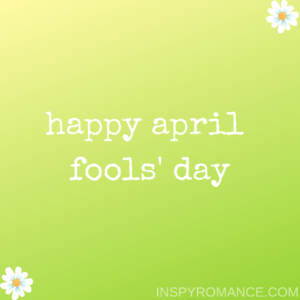 I tried to find some funny-but-friendly April Fools’ Day pranks that you could play on your someone special without too much cost and (hopefully) using items you already have at home. Brown-e Bedlam: Tell your sweetie that you’ve fixed a pan of brownies for dessert. Get a cake pan (or whatever you normally fix brownies in), and fill it up with cutouts of the letter “E” made from brown construction paper or white paper colored with a brown marker. You’ll want your pan to be covered with foil, and you might want to weigh it down with a small bag of rice or something to make it more convincing – especially if you send your honey to go get the pan. Post-It Prank: I’m sure you’ve heard of taking post-it notes and covering someone’s entire car with them. I love that idea, but I don’t have that many post-it notes at home. Nor do I have the time it would take. Instead, you can find something smaller that your significant other uses on a daily basis, and go to town on it. Favorite chair, coffee (or tea) cup, or the bathroom shower curtain. Go for it! Drawer Double-Take: Most couples share a dresser. If that’s the case for you, you can switch the drawers out. Either completely change out the drawers, or just change the items in the drawers so that your items are in your hubby’s drawers, and his items are in yours. It might not be laugh-out-loud funny, but it’ll definitely have him scratching his head. Silly Soap: If your significant other uses bar soap (instead of shower gel), you can paint the bar of soap with clear nail polish. Just make sure to get a good, thick coat on there. Candy Craze: For the record, this one would drive me crazy. 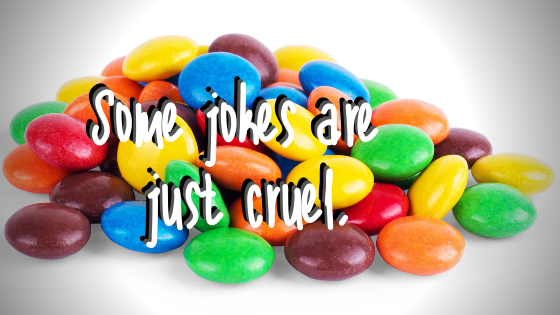 Mix Skittles, M&Ms, and Reese’s Pieces together in a candy dish and act like everything’s perfectly normal. What about you? Do you have any favorite pranks? Or something cute and fun that you do for your special someone to make him smile? Share in the comments! I have sweet friends who are celebrating their 25th wedding anniversary today. For her, it was the second marriage after a very bad first one. This couple must be one of the sweetest I know and the love the Lord Jesus. It’s such a pleasure to know them. They sound like a wonderful couple Anke – thank you for stopping by today! I’m not a fan of pranks of any kind. Oh Wemble, that sounds wonderful! I’ve known students to fill a retiring teacher’s office with balloons a time or two. (I *may have* participated in that, too.) I’m glad you could stop by the blog today! Hi Heather! I am not fond of pranks of any kind. Today I believe Mother Nature is playing a prank on all winter weary Midwesterners. Temperature this morning is 19 degrees. Last Friday we had HOPE that spring was in the air, as the temperature rose to 60 degrees. Yesterday there was snow in the air with a bitter north wind. Wemble’s post reminded me of a prank. May 1981 my German students presented me with a bundt shaped birthday cake. I had been on maternity leave in March. As I tried to cut the cake – the knife blade stuck. Students told me I was weak from having my son. The nicely decorated cake was a giant rice krispie treat. Best wishes. I remember one year mum put a freddo frog (chocolate frog) in my brothers lunch box for a treat only he didn’t know. One of his teachers saw it and made a comment about it and he thought she was playing an April Fools joke on him and he said If there is a frog in there you can have it as I am no fool. Well the joke was on him. He had to give it to the teacher. She got the last laugh! Haha those are some cute pranks. I sometimes do something funny and cute but not outlandish. Thank you for making me smile this morning. Those are cute and playful pranks. My family is big on humor and having fun. It keeps laughter in the house and our lives! I’m so glad you stopped by today Merrillee! What did your granddaughters end up settling on? Happy April 1st. Start to another wonderful month. The sun keeps peeking out and flowers are starting to pop their little heads out of the Earth. We have started planning for our vegetable and flower gardens. When I was in high school our whole family got pranked nastyilly. It sort of put me off of pranks. We’re enjoying the day with grandkids. Our 3 year old granddaughters wearing a unicorn headband with a stuffed horn on top. We left lots of people laughing at the gym and lunch. Blessings! Our family laughs a lot when together and will play small jokes on each other. HA HA HA HA!!! These are some great ideas! I wish I had read this earlier in the day! 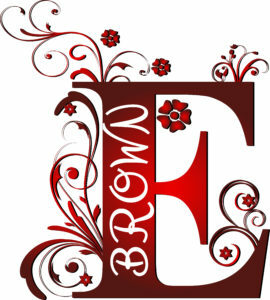 I might do the brown e’s joke with my hubby another day! This sounded fun.I should have had time yesterday to read it and I might have changed my husband’s ringtone. It would make him mad–and he would also find it childish.. maybe I would have to wait for the kids to grow up and then I’ll have allies.